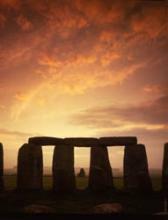 « How and Why Was Stonehenge Built? Lighting up the horses There have been occasions when white horses have been lit up at night, and it appears that there was once a tradition of doing this, at one or more of the horses, but information on this is scarce. The occasions known to me are described below, with the horses listed in alphabetical order. Alton Barnes This horse has been lit up on a number of occasions in recent years. 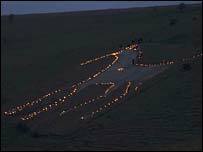 On the night of the winter solstice in December 2001, the Wiltshire Crop Circle Study Group lit the Alton Barnes white horse by candlelight. Some twenty-five people arranged tea lights in jars around the outline of the horse, on what was a very cold, wet and windy night. The jars were laid on their sides, which provided protection from the rain. The effect was dramatic, and despite the wind inevitably extinguishing some of the lights, the horse was still lit late that evening. The group hope to make this an annual event. This information was kindly supplied by Kate Fenn and Deirdre Edwards. The WCCSG arranged to light this horse again on 21st December 2002. I accompanied about a dozen members of the group who set out from Knap Hill car park at dusk in thick fog and rain. In the fog the party became separated, and only half reached the horse! Those of us who got there had between us only about a third of the total number of jars and tea lights that had been brought, but nonetheless we managed to light the horse to good effect, even though it could only be seen from nearby due to the fog. The horse was again lit by the WCCSG on 21st December 2004. The following is an extract from Melanie Gambrill’s account of the event: It turned out to be a great day weatherwise, with the sky clearing in the afternoon so we could watch a beautiful sunset before lighting the horse. Lots of people came so we got the candles and jars ready to light very quickly. As the sun set and the daylight started to fade we lit the candles. It must have been amazing to watch the horse being lit from a distance as the lighting progressed up the horse’s head, along the tail and up the legs until it was completely aglow. As darkness fell the horse lights became brighter and brighter. We could see vehicles stopping along the road below as people paused to view the lit horse. You can find Melanie’s full account and photos of the event here on the Swirled News website. I believe the horse has been lit every year since 2004, up to and including 2008. Cherhill The Cherhill white horse was floodlit to mark the coronation of King George VI and Queen Elizabeth in 1937. A generator was set up in the valley below, and cables were run up to the site. The letters G E were marked out with red bulbs above the horse, and several large floodlights were arranged to light the horse itself. The letters were lit for five seconds, then the horse for ten seconds, with this pattern repeating continuously. This illumination took place every night during coronation week, except for two nights when very thick fog prevailed. Devizes The new Devizes white horse was completed in September 1999. Later that year, on the evening of New Year’s Eve, the horse was very effectively lit by Pearce Civil Engineering, from dusk through to dawn on New Year’s Day 2000. Pewsey The new Pewsey white horse was constructed in 1937 to mark the coronation of King George VI. After construction it was floodlit for coronation week, and apart from thick fog on two nights the effect was very good. Westbury The Westbury white horse was lit up in 1900, and again in 1950, with equipment provided by the army. Apparently the effect was spectacular, and the horse looked as if it was floating in the sky. In 1950 traffic in Westbury and Bratton came almost to a standstill as drivers slowed down to look. Some local people hoped the horse would be lit up again in 2000 but this didn’t happen. There is local interest in repeating the event, however, and it may be that it will be done again on some future date.